If you’ve ever wondered what it might be like to walk or even run along an airport runway — and by the way, is there any race course more assured of being fast and flat than an airport runway? — you’ll get your chance at the 9th annual running of Brunswick’s Race the Runways Half Marathon, 10K, 5K and one-mile run. 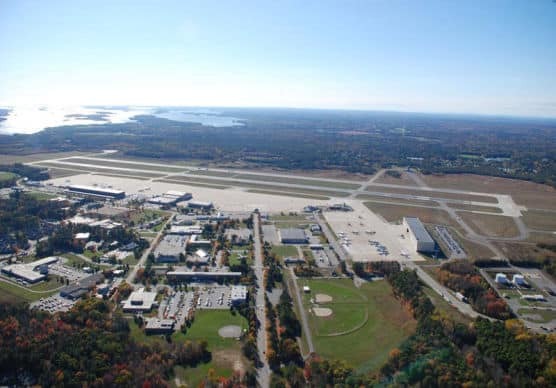 The home base for the race’s starting and finish line area lies right on the runway of the Naval Air Station Brunswick, one of two military airports in the state of Maine (the other lies about a two-hour drive to the northeast in Bangor). You won’t need to worry about planes taking off and landing during the race, however — NAS Brunswick closed a few years back as part of the Base Realignment and Closure process begun in 2005, and saw its final flight take off from the base in late 2009. Runners in the half marathon, like those running the 10K, 5K as well as the one-mile run, will get to enjoy one of the flattest race courses imaginable — long stretches of the race route are in fact perfectly flat. The race also features a newly redesigned course for 2015, as the race organizers gained full permission to use the full length of the runways for the first time in the race’s history. In 2018 the race organizers introduced a 10K race, giving runners another distance option. From the starting line right on the airport runway, runners first make a loop all the way to the end of the runway, where they make the turn and then run all the way to the other end of the runway, before turning off onto Orion Street. The course then brings runners around a U-shaped curve all the way over to the other side of the airport complex, where they’ll run a second time on the runway, this time for its full length. The final few miles of the half marathon unfold along streets the runners have already covered, bringing them back in to the finish line inside an airport hangar just off the runway. Though they may not realize it while they’re on the course, runners will be in the midst of literary history while they’re in Brunswick, as this was the town where Harriet Beecher Stowe penned her now-legendary “Uncle Tom’s Cabin” while her husband worked as a professor at Bowdoin College. Located at the head of Casco Bay along Maine’s southwestern coast, just over 25 miles northeast of Portland, Brunswick typically experiences mild to cool and occasionally still quite cold weather in April, which has brought record temperatures as low as 13°F (in 1954) and as high as 84°F (in 2003). On race day (April 27), the average low is 35°F and the average high is 57°F. See the race route map for the Race the Runways Half Marathon here. To reserve your spot in the early spring 2019 running of Brunswick’s Race the Runways Half Marathon, 5K or 1-mile race, register online at RunSignUp.com here. Ever run in the Race the Runways Half Marathon? Share your impressions here, or post your review in the Comments box below.